Twitter has become a household word for many of us - just like Google , YouTube , MySpace and Facebook (among others) have in the past. Lately I've noticed lots of people following my Twitter feed and I've been careful to follow back unless the feed looks like it's been robot-generated, is pornographic, etc. The result is - I follow lots of people and they follow me back..... keep it real and keep it clean and I will follow. Post something inappropriate and no more follow for you! - How many people looked at it? - How many people used it? - If they used it how did they use it? For example, let's say Mike Q posts a series of classroom ready presentations on wireless security on the web. We'll look for answers to questions like how the curriculum materials are being used, modified, and adapted to individual classrooms, and how the teaching and learning methods are impacting faculty and students. This level of measurement usually comes from observations, interviews, and focus groups all looking at the changes in the actions and activities of instructors, students, and ultimately workforce and industry. The term we commonly use when referring to these kinds of measurements is metrics . I'm particularly interested in Twitter because it has the potential to have tremendous impact without some of the tedious one-on-one type of measurement a lot of us are doing now. I've come across a couple of tools that attempt to do some Twitter measuring - a web-based application called Twitter Grader and another called Twinfluence . Let's take a look at both. Twitter Grader ranks Twitters on a percentage scale - looking at the screen shot below (Click it to enlarge) you can see I'm currently ranked at 99.7%. First and Second Order Networks: From the perspective of graph theory, a Twitterer's followers would be considered their first-order network, and their "followers count" the same as their "degree". "Degree" is a simple form of centrality measurement that equates to "prestige" or "popularitiy"; different types of centrality can measure connectivity, authority, and control in a network. Reach: Reach is the number of followers a Twitterer has (first-order followers), plus all of their followers (second-order followers). This is by necessity a crude maximum estimate, since there will definitely be duplicates and overlaps that could only be eliminated by up to thousands of API calls. Reach is a measurement of potential audience and listeners, a best estimate of the number of people that a given Twitterer could quickly get a message to. Velocity: Velocity merely averages the number of first- and second-order followers attracted per day since the Twitterer first established their account. The larger the number is, the faster that Twitterer has accumulated their influence. Of course, this number could jump significantly with the addition of a few high-profile followers. Velocity is scored from "very slow" to "very fast" relative to other twitterers at your network size. Social Capital: Indicates the average first-order network of a Twitterer's followers. It's essentially a measure of how influential are a twitterer's followers. A high value indicates that most of that Twitterer's followers have a lot of followers themselves. Social Capital is scored from "very low" to "very high" relative to other twitterers at your network size. Centralization: This is a measure of how much a Twitterer's influence (reach) is invested in a small number of followers. Centralization scores range from 0% (completely decentralized) to a theoretical 100% (completely dependent on one Twitterer). In social network analysis, a high centralization indicates dependency of the network on just a few nodes to maintain the connectivity of the entire network. Twitterers with low centrality networks would not have their reach greatly reduced if a few high-profile people stopped following them. Centralization is scored from "very fragile" to "very resilient" relative to other twitterers at your network size, implying that a network with only a few high-profile followers is very sensitive to collapsing if those followers leave. Conversely, a network with low centralization is not very dependent upon any few followers for its collective reach. At one time Twinfluence was attempting to measure efficiency. After discussions with some other social media experts, they decided that the idea of twitter efficiency is an interesting one, but there really isn't any way to effectively measure behavior in the context of how a twitterer actually keeps on top of their tweetstream. 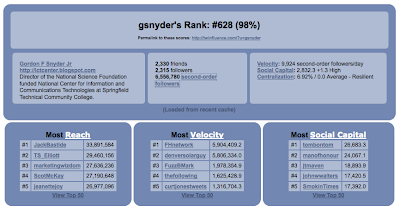 Twinfluence ranks me around 98% (similar to Twitter Grader ) with 2,315 followers and 6,556,780 second order followers. I'm not sure how significant the numbers are but...... if I can post something and have it potentially reach even one-tenth of a percent (6,500) of those 6.5 million second order users I'm really liking that possible/potential impact! I'm hoping applications like Twitter Grader and Twinfluence continue to improve and provide additional and more detailed metrics. This is good stuff. How Do Twitter, Google And Facebook Compare?